The aim of the program Entrepreneurship for Sustainability is to inspire and support students to set up their own sustainability initiative that will have direct positive impact on the campus and beyond. With E4S, a tailor-made program, we stimulate entrepreneurship among students & researchers and give them the opportunity to develop their entrepreneurial competence through workshops and mentoring support. The program consists of workshops, coaching and feedback sessions and a pitching event. In the meantime students can work on their idea and develop a business plan. 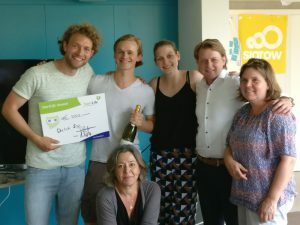 Entrepreneurship for Sustainability is collaboration between StartLife, StartHub and Green Office Wageningen.